At CTR, we see that every guest has the best vacation they've ever had! Colorado Trails Ranch is different from all other Dude Ranches-- and a very special place. Rather than being an adaptation of some sort of former ranch, ours was built to be a dude ranch from its very beginning in 1960. Prior to any original construction, there were only two buildings; a tiny old barn and the anteroom portion of what was once Coney Cove dance hall, built around 1912. This log structure is still in use today as wrangler staff housing. The first few years there was only the new lodge and six Alpine cabins. A lot of growth and change has taken place over the past half of a century on this guest ranch. In early years, guests made up their own brand, which was burned into the timber posts in the lodge. Those brands are still there, but this practice came to a halt many years ago. It was a sad end to a great Colorado Trails Ranch tradition, but necessary to protect the building from burning down. Each year, the ranch comes alive in May with the arrival of our staff from all over the country, and sometimes from around the globe. CTR would not be the special vacation spot it is without the liveliness, and vitality, of the staff. Horseback riding in Colorado is an incredibly unique way to experience the terrain. Discovering the vast mountain ranges, riding alongside a creek, or loping across a meadow - it’s easy to feel like you’re in a movie or fairy tale. You’ll have choices of morning and afternoon rides, or both. The lengths of these adventures can range from half day, chuck wagon lunch, and all day rides. Those looking for an exciting horseback riding vacation can also take part in a half day cattle drive, for a small additional charge. Teens are notoriously difficult to please. The last thing they want to do is go on family friendly vacations, worse still on an outdoor adventure vacation. Skeptical might not be an appropriate description of the reaction of your announcement that this year everyone’s going on a dude ranch vacation. Sound familiar? Don’t pay any attention to the sulking, it will all be quickly forgotten once they arrive at Colorado Trails Ranch, and see just how cool this adventure vacation stuff really is. The only reason teens are against these kinds of family vacation ideas, is simply because they don’t know what it’s really all about. Just wait until they feel the freedom of loping across the valley on a horse. Disney hasn’t got anything like it or white water rafting. They may arrive as the most jaded, skeptical guest, but they’ll be the first one out the door in the morning - ready to take the day by the horns. Your teen will be super involved with new friends and discovering so many new things. Booking your vacation for an all inclusive family adventure at Colorado Trails Ranch is like discovering you have located a home away from home. From 2013 to 2016, we have replaced all our cabins with larger cabins-- and all with living rooms! 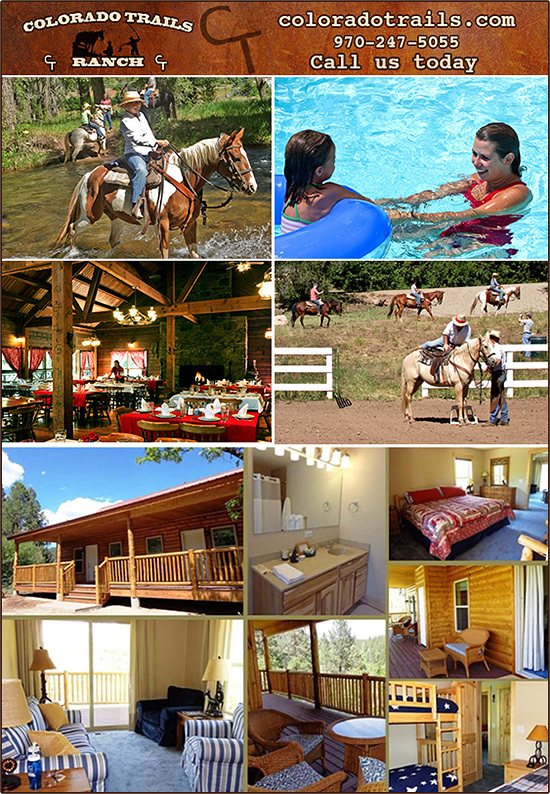 The guest ranch cabins are comfortable, and beautifully decorated with a casual luxury. Once here, you may find that like all other guests, it’s hard to tear yourself away… from the gorgeous surroundings, the fun loving ranch family and this new found freedom. The cabins included in our adventure vacation packages feature private baths for each bedroom, daily housekeeping, living rooms- and inviting porches just right for watching the sunset or visiting with new friends. The view from the cabins is incredible, a panoramic display of our awesome mountains and clear night sky. The stars really do seem within reach here. What Is The Food Like At The Ranch? We guarantee you’ll enjoy every meal served during your stay. It’s one thing for us to tell you that our chef is one talented cook, but it takes more than words to prepare you for the dining experience at Colorado Trails Ranch. Everyone raves about the food. It is one part gourmet and one part homemade goodness, always high quality, healthy and sensational. We’re well aware that meals at home are hurried events or eaten on the run. Every part of a vacation should be pure pleasure, and on our guest ranch, you have the opportunity to indulge yourself in scrumptious, yet wholesome food. Menus are fulfilling, diverse and satisfying to both adults and children alike. Even your picky eaters will be thrilled with the delicious meals that are part of our all inclusive vacation packages. A great summer takes a little planning! The only planning you have to do is to pick up the phone and call us today and we'll take care of the rest. For more information about our camps as well as our other packages, please call us today!